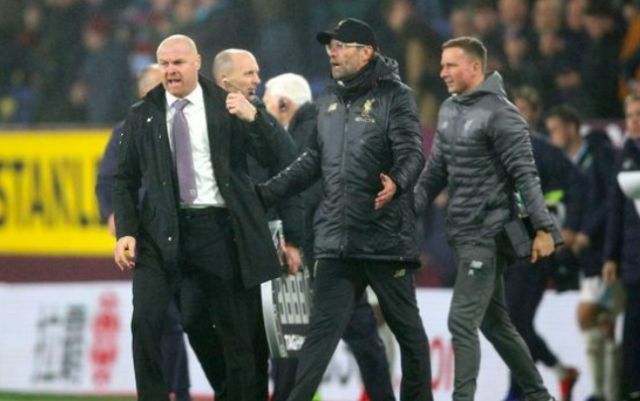 Former Premier League goalkeeper Mark Schwarzer has defended Sean Dyche’s actions after Burnley’s 3-1 loss to Liverpool on Wednesday evening. Following the 90 minutes, Dyche lambasted Klopp on the touchline, after Liverpool’s manager had spent much of the second-half complaining about Burnley’s reckless tackling. Liverpool defender Joe Gomez fractured his leg after one coming together, and both Naby Keita and Alberto Moreno were lucky to avoid injuries themselves after horrible challenges from our rugged opponents. But Schwarzer believes Dyche was in the right and Klopp should have kept his mouth shut and accepted his opponent’s physicality. “It’s a brilliant tackle from Mee, it’s what you want from your centre-half. It’s not a Burnley-specific tackle, it’s a defender’s tackle,” he told Sky Sports’ The Debate Show. “Sean Dyche is rightly upset and annoyed by the comments. I think that is a tackle you want every centre-half to make. “I’ve seen Liverpool play, Virgil Van Dijk and Joe Gomez have made those challenges and it’s no different to what they’ve done. “It’s more frustration from Jurgen Klopp, he’s lost Joe Gomez, he’ll be out for a long time. He plays at centre-half, he was out of position on the right, I’ve seen him play there before and I don’t think it’s his position. There’s a thin line between a good, strong tackle and something dangerous – and on more than one occasion Burnley stepped over it. Klopp is now without a crucial part of his team in Gomez for six weeks, so we think he’s perfectly entitled to comment on the nature of Burnley’s tackling. Liverpool got the three points, but the loss of Gomez for the entire winter period is very hard to take. Dejan Lovren and Joel Matip are going to have play sublimely in Gomez’s absence if we’re to keep pace with Manchester City at the top of the table.